So, I’ve been thinking about STEAM (Science, Technology, Engineering, Art, and Math) projects lately. I spent some time over winter break making Chibitronics projects with my personal kids. 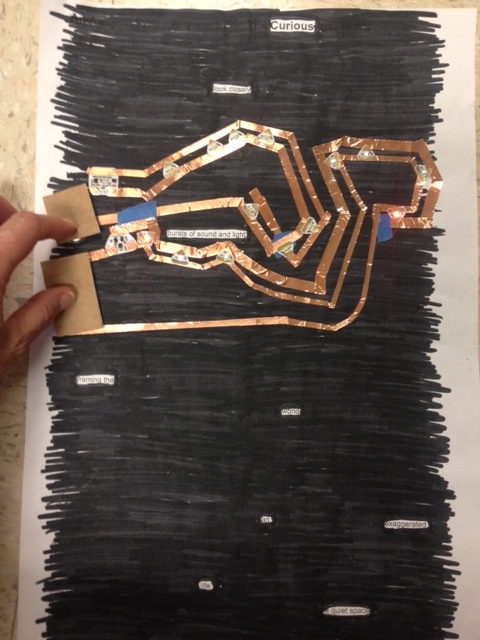 And then I decided to introduce paper circuitry to blackout poetry. You know how sometimes you think 2 kids or people should be friends? You see all these connections, but they don’t? It was a little like that with my Chibitronics and Blackout Poetry matchmaking; they were not friends right away. However, as they have sat day after day near each other on my desk, a friendship has developed. Here are some details. I started with my blackout poem. Then, I had been playing with DeviantArt-Muro and the drawing with text options. I entered my entire poem as the text and then drew with the words in the shape of exploding fireworks, since that is what “bursts of sound and light” suggests to me. I printed this, enlarged, on to various colors and qualities of vellum. I ended up with this. (many, many tries later). 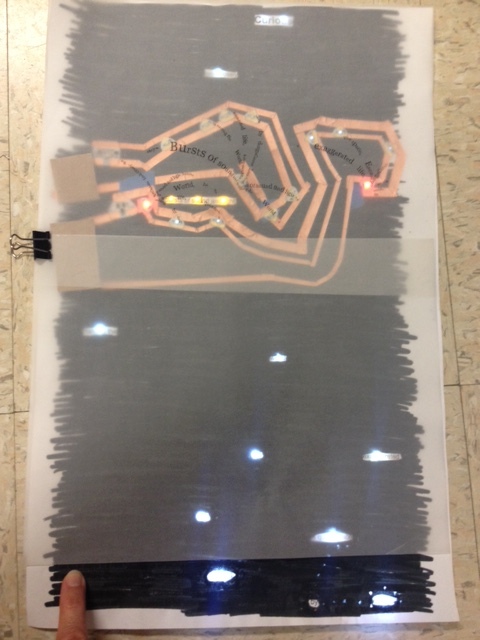 So, then I used the copper tape, light stickers, and some sensor controllers to make 2 circuits that light my “fireworks”. One lights in response to sound, which you can’t see in the static image; the other is set to twinkle. However, the copper tape lines and battery folds are a little distracting, I think. Plus I wanted the actual words of the poem to be more prominent. My next idea was to create another circuit that would be on a lower layer and position the lights at the location of the words in the poem. 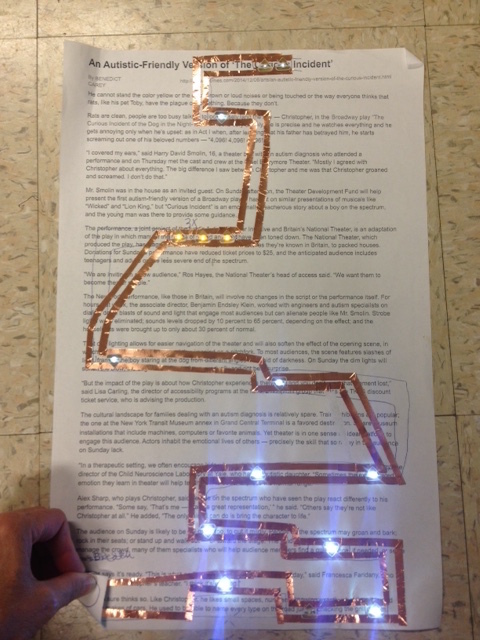 With one battery, the lights were not lighting consistently and were not powerful enough to be seen through the paper unless they were pressed together. I tried sewing the layers together, messed up the order, removed the thread, and then realized that another battery would help. With all the layers together, here I am. Do I somehow cover the path of the circuit on the fireworks lights? I find it distracting.